We see it all too often: A product makes its debut. It experiences popularity but then sales begin to dwindle. Costs remain higher without revenue to offset production. Enter strategic sourcing and procurement. SS&P is then brought in as the "necessary evil" to help cut costs. And, we can do this in a number of ways: negotiate prices decreases through order volume increases, partnering with a contract manufacturer, or even support the process of taking manufacturing on internally. These may all be viable options, but the truth is, waiting later in the product lifecycle is selling SS&P short. Waiting until maturity or even the decline stages of the product lifecycle caps the impact SS&P could have when it comes to not only optimizing budgets, but also innovation. It's a symptom of a greater challenge for many Strategic Sourcing and Procurement Groups - a lack of strong collaboration between SS&P and other functional department stakeholders. Demonstrating SS&P's impact beyond cost savings remains a challenge in the industry and a topic to be addressed during the Institute for Supply Management's Annual Conference coming up in May. For many companies, functional departments simply see SS&P as an added obstacle to the process of obtaining the goods and products they need. As a result, particularly in direct materials sourcing, SS&P is brought in later in the Product Lifecycle. As a result, major opportunities are left on the table. 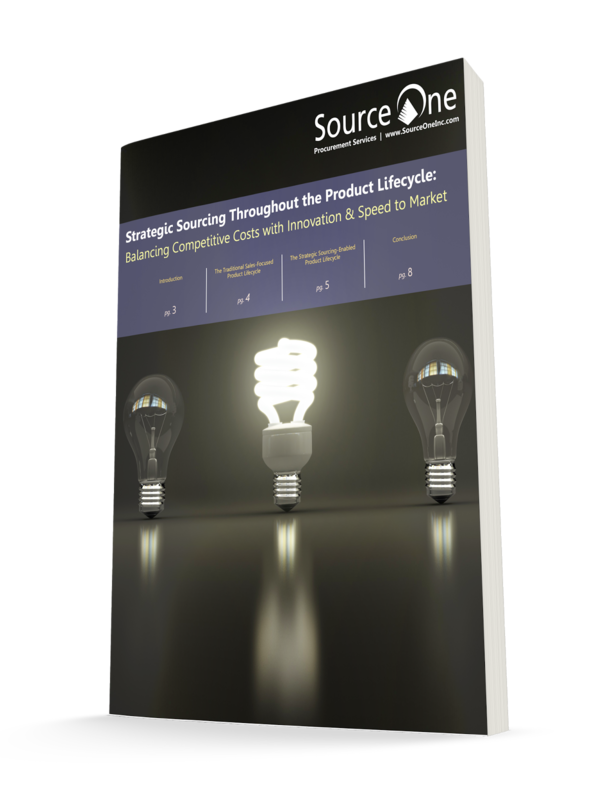 Addressing this continued challenge, Source One's direct materials sourcing experts have published a new supply management white paper titled, Strategic Sourcing Throughout the Product Lifecycle: Balancing Competitive Costs with Innovation & Speed to Market. The white paper, which includes case study examples, presents the business case for engaging SS&P at each stage of the Product Lifecycle, including Ideation, Production, Manufacturing, After Sales Service, and Product End of Life. The white paper aims to demonstrate Sourcing's value as a strategic partner and not just a resource for cutting costs.